Note: The 250 homes built for workers to be employed at the Dearborn Fordson Tractor plant are located on Beech Street, Edison Street, Francis Street, Gregory Street, East Military Street and Nona Street. Henry Ford appreciated engineering innovations. He also presumed that banks and most financial institutions took unfair advantage of their customers. In 1915, Ford erected the Henry Ford and Son tractor plant along the tracks of the Michigan Central Railroad near the point where they crossed Oakwood on the west side of what would become Dearborn. At the time of the building of the tractor factory, it was located in Spingwells Township. Ford expected that his durable and labor saving tractors would become just as popular as the Model T so he anticipated that his plant would expand. About 400 men worked at this plant in 1918 but they faced a major problem. There was no place nearby to live. Land speculators believed that Ford would increase employment in Dearborn so they bought vacant lots. Those who owned homes or rented them to workers greatly increased their prices as more and more men were needed at Ford’s tractor factory. The employees at the plant who did not live nearby typically spent more than an hour each way on a street car to get to work and then get back to their homes in Detroit. E. G. Liebold, who was Henry Ford’s personal secretary, suggested an innovative solution, one that was immediately popular with Ford. Liebold proposed establishing a for-profit company that would mass produce attractive, high quality homes near the tractor plant. These orderly homes would only be sold to workers at the tractor plant. The new company would finance the homes so no banks would be involved, but if a worker tried to sell the home before he lived in it for seven years, the worker would have to sell it to the developer. This was done to prevent speculation and to keep banks from owning any of the homes. Ford, in essence, had the funds to build these homes and to keep banks from financing or owning them. The Dearborn Realty and Construction Company was chartered in January, 1919. Henry Ford held no shares but his wife, Clara, and his son, Edsel, owned two-thirds of the shares. In the spring of that year, the development company purchased 312 lots in the J. B. Malony Subdivision then bounded by the Michigan Central Railroad, Military, Nowlin and Monroe. J. B. Malony was born in Illinois in 1849 but moved to Detroit in 1865. After studying in Detroit and Quebec, he practiced law in Detroit. He became the clerk of the Superior Court in 1877 and then was appointed by President Grover Cleveland as the Collector of Internal Revenue in Detroit. Later he moved on to serve as Controller for the city of Detroit. While holding these jobs he speculated in real estate. He purchased 100 acres in Dearborn in 1891 from David Lapham and plotted 502 lots, each 50 feet by 125 feet. He laid out and named the streets along with an alley in the center of each block. These service alleys that he designed still exist. Malony was unable to pay his mortgage that was held by the previous owner, David Lapham. In 1898, Lapham foreclosed and regained ownership of much of the Malony subdivision. Twelve years later, Lapham sold his holdings to Henry Ford. The Dearborn Realty and Construction Company then purchased the lots they needed from Henry Ford. To minimize costs, the Dearborn Realty and Construction Company built a planning mill to produce the standardized wood materials, a plumbing shop and a tin shop. Crews took raw materials from railroad cars on the Michigan Central lines and turned out the items that were needed for the mass production of new homes in this neighborhood. A narrow gauge railway was laid in the alley between Nona and Park streets and transported construction materials to home sites, a narrow gauge railroad that used horses for motive power in 1919. Borrowing from the assembly line methods Ford used so successfully in his Highland Park auto plant, several specific crews did the same tasks at each home. The first crew dug the basement. The second crew built the foundation. The next crew put up the outside framing. The fourth crew finished the interior and, I assumed, installed the plumbing, heating and electrical work. The final crew was responsible for the exterior and the landscaping. Many of the men employed in this endeavor had worked on the Henry Ford Hospital on West Grand Boulevard that was completed about a year earlier. Two other issues were important to Henry Ford. One was an insistence upon very high quality materials so that the homes would retain their value and usefulness. The other was that these homes not look like an unattractive mass produced subdivision. Albert Wood, a Ford staff architect who had designed much of the original Henry Ford Hospital designed seven different types of homes. These were known as “A” Houses, “B” Houses, “C” Houses, “D” Houses, “F” Houses, “C-B. V” Houses and “F-B V” Houses. All were contemporary, two-story residences with a full basement, a living room, a dining room, a kitchen, one bathroom, a porch and three bedrooms. Thirteen homes were built with a fourth bedroom. To further remove any suggestion that this was a low-cost, cookie-cutter suburban development, the homes were strategically varied in their distance from the streets that J. B. Malony had laid out a quarter century earlier. In addition, the purchaser had some choice with regard to exterior trim further distinguishing each home. Some elegant touches were added. There are no electric wires on the streets. They were run down the rear alleys with an underground cable bringing a wire to the attractive and unique street lamps that still cast their glow. At various points in this project, plans were announced to build as many as 500 homes although the original purchase of land obtained just over 300 plots. Construction began in May, 1919 and 94 homes were finished that year. 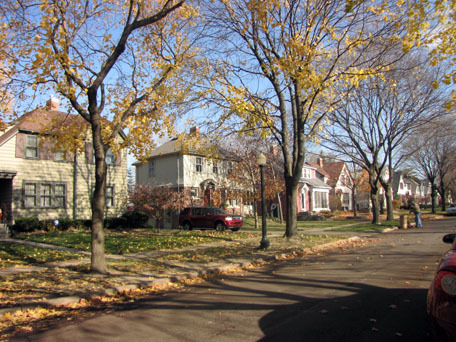 At the start of 1920, the Dearborn Realty firm planned to put up between 200 and 350 homes that year. However, only 156 were built and, after 1920, there was no additional construction. Henry Ford expected tractor sales to boom but that did not happen. The economic chaos in the period immediately following the end of World War I developed into the agricultural recession that reduced farm income greatly throughout the 1920s. Many farmers lacked the funds to buy new Ford tractors. There was no need to expand the tractor plant at Oakwood and the Michigan Center. Indeed, Henry Ford closed the Dearborn tractor plant in September, 1920 and shifted tractor production to the River Rouge plant on the other side of Dearborn—a plant that opened during World War I for the production of boats. You might think that it would have been easy to commute from the Henry Ford Homes area to the River Rouge plant but it was not. There was no convenient public transportation and, in this era, most workers did not own cars. The demand for these homes plummeted with the closing of the tractor plant. Prices were reduced from about $9,000 to about $8,000 but the last of the homes built in 1920 may have remained unsold until 1924. This is one of the more attractive historic districts in the metropolis. 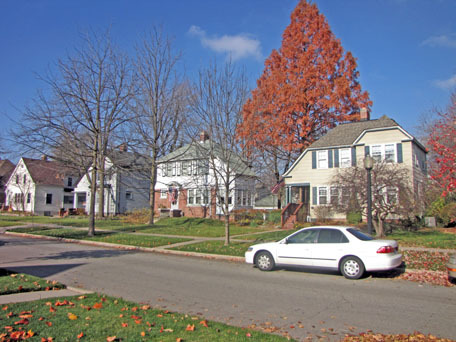 Although the homes are modest colonials, the neighborhood has an appeal that may rival the appeal of Indian Village or Palmer Woods in Detroit. 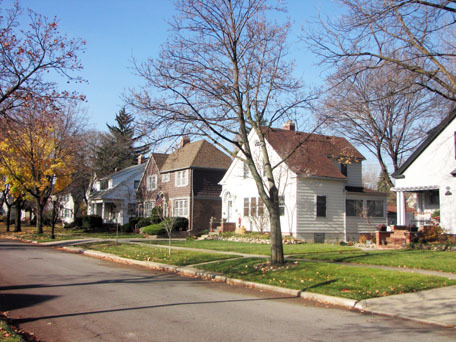 It is very well maintained neighborhood and many of the residents take pride in occupying a home built as part of Henry Ford’s experiment with mass produced housing. Quite a few of them have a letter posted near the door indicating their type. There are many in-fill homes in the Malony subdivision but they well complement the homes that Dearborn Realty constructed for the men building tractors nearby. 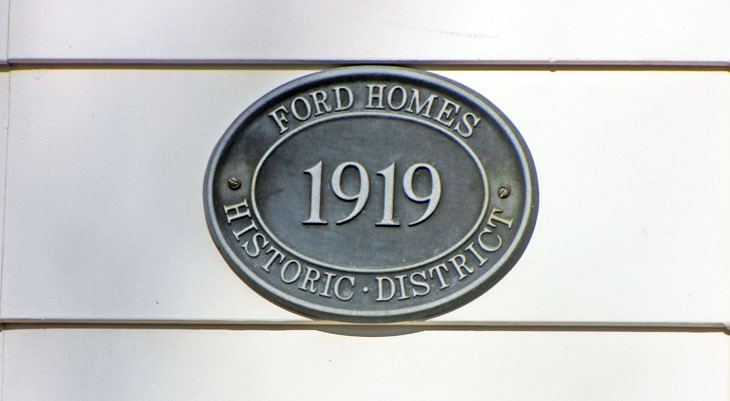 Chapter One of the book, Entrepreneurial Vernacular: Developers’ Subdicisions in the 1920s by Carolyn S. Loeb (Baltimore: Johns Hopkins University Press, 2001) describes architect Albert Woods and the history of the Henry Ford Homes development. Wood lost his Detroit job during the Depression and moved to Port Washington on Long Island where he designed furniture and churches. Date of construction: 94 homes were built in1919, 156 in 1920. 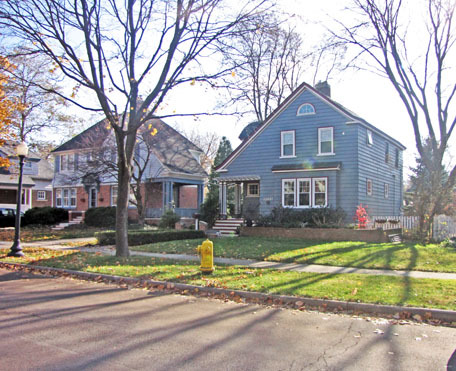 Architectural Style: There are six types of World War I era homes. have not found documentation of this.